You’ve got a fish bowl in your restaurant offering some sort of prize to customers for putting their business card in. Or you go to a conference and exchange cards with everyone you sit near, and have lunch with. Or your local Chamber of Commerce has a display of every member, and you gather up one of each. Then you decide to start an email list, thinking you now have hundreds or thousands of people you can add to their list! Cool? What did the fish bowl actually say? Hint: getting spam from you is not a prize. 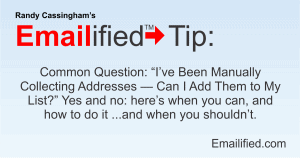 If you’re absolutely sure they’ve recently provided their email address to you so that you can put them on your email list, then you can add them to your list in the manner described in the next section. If you have their cards/addresses by other means, such as a fish bowl or other anonymous technique, don’t do it — period. But there’s a lot of gray area in between (such as those folks from the conference who handed you their card last weekend). Let’s go through those one at a time. For people who have actually asked you to add them to your email list — say, a signup form at your business or on the back of the bill at a restaurant where it explicitly says this is for your mailing list, yes: it’s cool to put their email address (and, preferably, name) on your site’s list signup form yourself in a timely fashion — not next month, and preferably not even so late as next week. The next day (or, better, that evening!) is best. Yet even in this case, I’d have it set up with a confirmation loop that sends out a thanks for their interest, says what the list is, and sets clear expectations for what will be sent, and how often. And then they can choose whether or not to click the confirmation link to activate their subscription. If they click, great. If not, then don’t push further. Maybe they’ll give you their address again in the future, and you can try again. But don’t even think about adding them to your list without a confirmation process. Getting spam complaints or angry customers is definitely not going to help your business succeed. But those who asked for it and confirmed are golden — just the kind of customer you want. They know you, but …you weren’t clear that you have an email list. But …you’ve been gathering the cards for months, and only now are you getting your list going. Can you add these people? A very qualified yes. Here’s how I would do it. First, “they know you” must be satisfied. If you called them on the phone and introduced yourself, would they know you or your business? You’re sure? Then I’d send them an email — a personal, one-on-one email — saying hello, addressing them by name, reminding them how they know you (that is, give context), letting them know how you can help them (demonstrate the value you’ll provide them), and letting them know they can get that value on your email list, which will have weekly tips or specials or whatever if they want. You can copy/paste a lot of this in to each individual email to make it easier, but I definitely wouldn’t do a “bulk mail” to a lot of people. One-on-one is the rule. Then they go to your web site and sign up, rather than you adding them, and then they go through the confirmation process. For those you met at a conference, it’s much the same: say hi, remind them that you met them at the conference last week, you have this and that value to offer, here is where they can sign up for your email list, and “let me know if I can help you in any way with [conference topic] or [your expertise].” Then you’re done and move on. Again, this is a one-on-one process where you address them by name. The cards you have from everyone else, those you can’t honestly say would remember meeting you, like the cards you picked up at the Chamber of Commerce? Toss them in your recycling bin. Don’t even think about adding them to your mailing list. That’s definitely spam, and the resulting complaints WILL hurt your email reputation — which means reduced “deliverability” to actual customers who DO want to hear from you. “Everyone Else” isn’t even a gray area: do not add them to your list, even with a confirmation process. Because those confirmation emails marked as spam absolutely do count against you. Any questions? That’s what the Comments area below is for! I attend a conference for software that I support at work. They promote people “getting scanned” at their major supporter’s booths by offering door prizes for those that get stamps at each of them. A few will add my name to their mailing list and I will nicely click the unsubscribe (only a few that I already know actually apply to my smaller area of work) button. Then there are those that someone sold to other companies. Those get the junk email button in Outlook. I wish I had a stronger way to mark them as spam like google mail’s spam button that really did mark them. A year ago one of the vendors decided to sell the list they collected to a “list of people in manufacturing that purchase items”. I know this because the really ugly spam (items I have nothing to do with) started showing up a couple days later, many labeled with the site that they got them from. Checking on the site, they offer cash for names. It’s amazing how unprofessional some people can be. I may use one of my spam filter addresses to register for the conference next year instead of my real address so I can add them to Gmails spam list. A perfect example of what I was saying: instead of having a positive relationship with a potential customer, Bill’s instead trying to figure out how to cause more harm to the mailer by using gmail to click the “Spam” button, which WILL cause delivery problems for those mailers in the future. And you know what? They deserve it for using such tactics.